Yesterday we covered how Google Poland is warning SEOs about their behavior there and harming their clients by not adhering to the Google Webmaster Guidelines. Shortly after I reported that Artur Strzelecki mentioned on Twitter that the Google Poland blog itself isn't really setting a good example of listening to their webmaster guidelines. If you look on the sidebar, there is a very keyword rich link, to a personal blog of a Google employee. 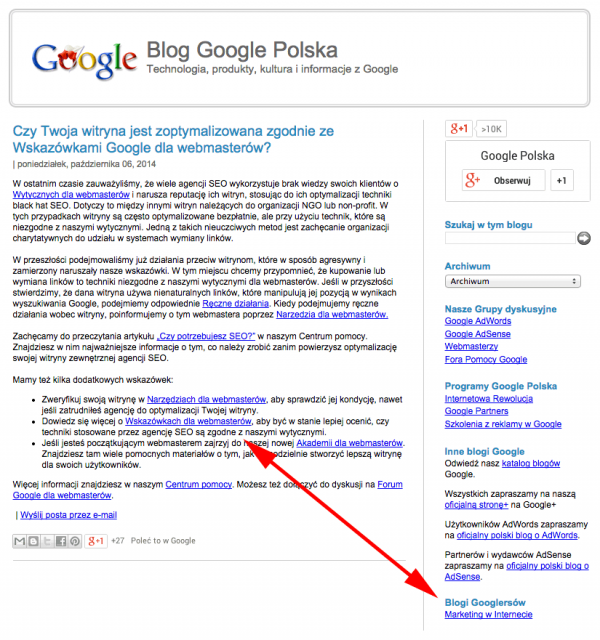 The link goes to the personal site of Mariusz Gąsiewski, who has been working at Google Poland since 2007. The anchor text translates to Marketing on the Internet and links to ittechnology.us. Maybe Google should tone down the links on the sidebar of the Google Blog? They did on the main English Google blogs years and years ago, where they use to link to this site and many other industry sites like this. Update: The link has been removed within hours of posting this story.